Overview: the circulatory system is a series of connected tubes that link together the major organs of the body. The heart pumps blood around these tubes in a double circulatory system. The right ventricle pumps blood to the lungs, whilst the left ventricle, with its thicker muscular wall, pumps blood to the remaining body. Arteries transport blood away from the heart, under high pressure. Veins transport blood that is returning to the heart under lower pressure and so have veins to prevent blood flowing backwards. Capillaries provide the site where materials are exchanged between cells and the blood. A key function of the circulatory system is to transport the reactants and products for respiration. Once students are confident with how oxygen, glucose, water and carbon dioxide travel around the body you can explore other components of blood such as hormones, urea, platelets and lipids. The circulatory system provides a great opportunity to teach students the important relationship between structure and function in biology. 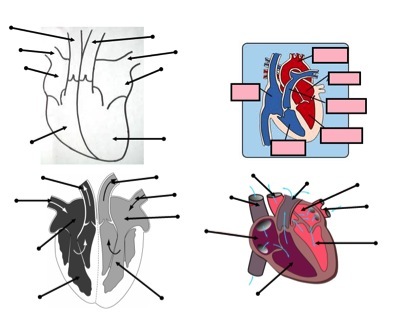 Many adaptations are explained by the fact that in a closed circulation the volume of blood flowing through any cross-section of the circulatory system per unit time (V) is constant, V = A x R (Yip, 1998). Key concept: blood moves from higher pressure to lower pressure through the circulatory system and transports reactants and products of respiration, products of digestion, hormones and white blood cells around the body. The structure of blood vessels and the heart are related to their function. Misconception [scientific idea]: blood is made in the heart [blood is made in the bone marrow]; blood is a cell [blood is a tissue]; blood flows slowly through the capillaries because of their narrow lumen [blood flow rate is lowest at the capillary network because of its large total cross-sectional area (1000 x that of the aorta]. I think it is helpful to begin with the components and function of blood – the stuff that you are transporting. Get a jug – fill it with water (plasma). Now add in some white blood cells (polystyrene), red blood cells (Cheerios stained with red dye) and platelets (plasters). Take this blood to the ‘stomach’ – add in some salts (NaCl) and glucose (sugar). You could also add in amino acids (glitter) and lipids (oil) too. Add in some urea (yellow balls) from Liver. Blow into the mixture some oxygen. Give it a good stir. Now how do we get these substances to the cells in our foot? What waste substances will now be added (carbon dioxide). What are the advantages and disadvantages of an organism having small red blood cells as opposed to larger ones? Why don’t bacteria have a transport system? What are the minimum requirements of a transport system? Fish have a single circulatory system. Mammals have a double circulatory system. What are the advantages of a double circulatory system? Yip, D. (1998). Teachers’ misconceptions of the circulatory system. Journal of Biological Education, 32. 207-215.